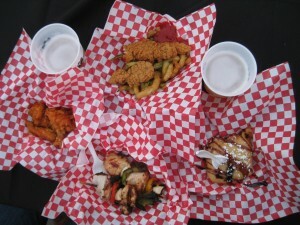 Who can resist wings, fried s'mores, fried veggies & kabobs? The San Diego County Fair opens on Friday June 12th and runs through through July 5th. I’ve been going to the fair since I was a kid, but now that I’m a little older there are two things that get me out to the Del Mar Fairgrounds: food & concerts. This year the fair has loaded up on both. The theme for 2009 is Music Mania and the fine folks at the fair have brought in some big name acts. I’m secretly excited fairly certain my wife will drag me out to see Kelly Clarkson close out the fair with her July 5th show on the big grandstand stage. Also playing are American Idol season six top two David Cook and David Archuleta. For those over 13, there is also a nice mix of artists like Loretta Lynn, Clint Black, Brett Michaels, the B-52s, and San Diego’s own Switchfoot. Remember that the grandstand concerts require an additional ticket in addition to your fair entrance. I was fortunate enough to get out to media day last week for a little tasting session of fair food. It wasn’t all bad though. My wife stayed true to the plan with a kabob, corn and some BBQ beef, so there are some non-indulgent offerings that are still delicious, but who can resist fried Twinkies? Two Dollar Tuesdays Kids 12 & under are free every Tuesday. On June 16 Fair admission is just $2.00, with special tickets available only at Albertsons. 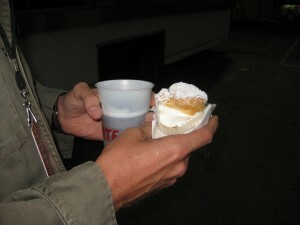 This entry was posted in Attractions, Insider Tips, San Diego Events and tagged fair, food by Brian. Bookmark the permalink.